Call them partners in frustration. 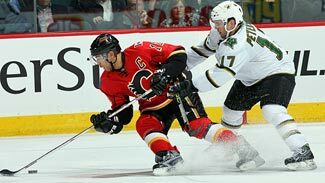 Erik Cole and Sam Gagner were both struggling mightily with the Edmonton Oilers until coach Craig MacTavish opted to put the two together. Heading into Friday's game against the Wild, Cole and Gagner were on fire. Cole was averaging a point-per-game over his last dozen outings and Gagner had nine points in 12 games. "It couldn't have gotten any worse from where we were at," Cole told Joanne Ireland of the Edmonton Journal. "Any improvement would have looked like a milestone. We were both stuck in a rut for a while and when (MacTavish) put us together, we were pretty intent on helping each other dig out of it. It's worked out really well." "We were struggling with line combinations and virtually everyone had played with everybody else," MacTavish said, "so you put them together, and they looked like they had some chemistry. Sam has that good delay game through the neutral zone and Cole can get the puck wide and come with speed. It looks like a good fit for the two of them." "I'm certainly more confident with the puck and doing a lot more positive things with it," Cole said. "I feel like I can contribute consistently every game, every night, every shift. My game still needs some work. There're still some things I need to do even more consistently, more responsibly to give (MacTavish) that confidence in me and my linemates." "He skates so well and he is always backing off defenders," said Gagner. "When I have that room and I have the puck, that's what I like. I like to slow the game down a little bit and try and make plays. There's been good chemistry there." Montreal will be the center of the hockey universe next weekend when NHL All-Star Weekend comes calling. And there are those who will argue quite strenuously that Montreal is the center of the hockey universe all the time. It's been said countless times, but hockey is religion in Montreal complete with all the fervor, devotion and mysticism that accompany all matter of faith. Some wise man once argued to never argue religion or politics. If he had been from Montreal, he would have added hockey. Which brings us to the torrent of rumors that have made the rounds in recent days anticipating a blockbuster deal that would bring Vincent Lecavalier to the Canadiens for a package of players, prospects and picks. Will it happen? Everyone involved has said "no" so often you can't help but think it's wishful thinking. "He's not being traded today, he's not being traded tomorrow, or anytime soon," Bolts General Manager Brian Lawton said pretty emphatically. "Vinny Lecavalier is not being shopped by the Tampa Bay Lightning. "We have a little bit of a perfect storm going with Vinny's situation -- new (Lightning) ownership, the 100th year in Montreal and all that good stuff," Lawton said. But let's toss in the age-old disclaimer, "if Wayne Gretzky can get traded ..." just to be safe. Still, all the hubbub also points out why Bob Gainey may be the perfect general manager for Montreal. Think about it for a moment. Have you every seen Gainey flustered, either during his illustrious playing days or as an executive? The man has weathered some personal tragedies that would have made the rest of us collectively collapse, and he remains calm, dignified and classy throughout. With all he has faced, a trivial thing like a trade rumor is no big deal. So with the heat on from the fans, who would clearly love to see a native son like Lecavalier return home, you don't see any deviation of purpose from Gainey. "In the final analysis, I have to keep an eye on what my job is and what my priorities are," he told Dave Stubbs of the Montreal Gazette. "It's not about an individual player. It's about our group. "I still have a real strong belief that the people who support us, who really care about us, the fan base and our ownership, want a good team, with players who play with all of their passion and talent and spirit. "I'm sure (fans) have their preferred players they'd like to have. But above that, they want to have a good team." And the Canadiens do have a good team thanks to using the team-first philosophy espoused by Gainey. "The business is winning," Gainey said. "It's about getting better and stronger than your competitor, and supplying your supporters with what they're hoping for." Strange reunion -- Yes, Brendan Shanahan is back with the New Jersey Devils, but no, this hasn't been a case of old friends being reacquainted. Shanahan, after all, played in New Jersey from 1987-1991, so no Devils from that era remain. In fact, the only former teammate of Shanahan's is goalie Kevin Weekes, who was with the Rangers when Shanahan was there. Still, Shanahan expects no problems fitting in. "I think hockey players speak to each other on the ice with their actions," Shanahan told Tom Gulitti of the Bergen Record. "I never thought friendships were something that developed overnight or through a speech." Shanahan has signed on for the remainder of the season and will join the lineup after a few practices with the team. "He looked pretty good [Thursday]," coach Brent Sutter said. "He's still in a situation where he has to get into game-like situations in practice. [Thursday] was a start where we worked on some game-type situation things. But I thought he [did] pretty well for his first day. He's obviously in pretty darn good shape." Sutter said he didn't know yet what line Shanahan will play on. Shanahan rotated in on both wings Thursday on a line with Jay Pandolfo, Bobby Holik and Mike Rupp, but Sutter said that was "no indication whatsoever" of who he will play with in his first game. "I'm just sort of feeling my way around and trying to fit in," Shanahan said. "I really feel that it's my job to find a way to fit in and not the players' job to help me fit in. I've come here to help this team and it's already a very good team." Timely advice -- A big part of NHL All-Star Weekend is NHL players meeting with a variety of print and electronic media. So, a recent column by Adam Proteau in The Hockey News provided some timely advice for players who will be chatting about hockey. Proteau's subject is the Sharks' Jeremy Roenick, known as a "great quote" throughout his career. Here is Roenick's advice. "There are two ways players can be better interviews," Roenick said. "No. 1: speak your mind. If you feel passionately about something, then grow a pair, grow a thick skin, and say so. Don't be afraid that you're going to say the wrong thing. If it comes from your heart, if you know that you're right, step up and let people hear what you have to say. "And No. 2: Show some (expletive) enthusiasm during interviews," Roenick said. "I see too many interviews where young guys say the same thing night after night after night. It's (expletive). "You know what, guys? Don't just give us the usual clichés. Don't do interviews where your eyes are just staring off into space when they should be looking into the camera. Say something funny once in a while! And if somebody scores a sick goal, it's OK to say 'damn, my teammate scored a sick goal!' "
It has been said time and again that goalies have the worst deal during NHL All-Star Weekend, facing a barrage of shots from offensively gifted players who aren't going to check and block shots with the fervor reserved for the playoffs. So, what to do? That's the question we posed to Boston Bruins goalie Tim Thomas. "You got to keep in mind that they're gonna score. These are the best scorers in the world," Thomas said. "They're some of the best D in the world there, too. They're probably not going to be blocking as many shots and stuff like that. Having been there, playing in the third period, I happened to get in during a tight part of game. I think actually I was fortunate enough to have a little bit better defense than a couple of the other goalies had, the way it worked out. But it's still fun." Thomas made his All-Star Game debut in Atlanta last year. He said a return trip is just as daunting. "It's even more of a challenge," Thomas said. "Last year I think I was a little bit nervous. I had a great time, enjoyed myself. But I was a little bit nervous being on that stage. I think this year I'll enjoy it probably even more because I think I'll be able to relax a little bit more, soak it in a little bit better." Hat's off to Pappert -- We have mentioned this before, but a 14-year-old Kalan Plew who had a stick from Henrik Zetterberg ripped off by some cretin at the Bridgestone NHL Winter Classic has gotten the stick back thanks to Robert Pappert. A dentist living in North Carolina, Pappert purchased the stick, not knowing it had been stolen. According to Christopher D. Kirkpatrick in the Charlotte Observer, Pappert mailed the stick back. "The stick was never mine, it was that little dude's," said Pappert, a diehard fan who flies with his wife around the country to attend NHL games. Pappert and his wife, Lori, live in Piper Glen. But he grew up in Chicago and she in Detroit -- making them natural sports rivals. The Papperts flew to Chicago to watch the Bridgestone NHL Winter Classic. About 30 minutes after the game, Pappert said he bought the stick for $100 from someone in an official-looking usher's jacket who was standing in the men's restroom. Pappert, none the wiser, returned home with the souvenir and showed it off to friends. But last Thursday, one of those friends directed him to a blurb about it in the Detroit Free Press online. Pappert found a bigger story about the theft online in the Chicago Tribune. He sent an e-mail to the Tribune the next day, wanting to return the stick. "If I would have ever thought there was anything wrong, I would have beat him with that hockey stick myself," Pappert said of the man who sold him the souvenir. "This was not a hidden thing. I came out of the bathroom happy and yelling and screaming. We had one guy offer us $1,000." "I'd really like to thank (Pappert) for realizing he wasn't the one who was given the stick," Kalan told the Tribune. "... I'm definitely going to display it, probably in my room, so people can say, 'Whose stick is that?' And I'll say, 'Henrik Zetterberg. He gave it to me.'" Remember the name -- Let's be honest, before the season started, the only folks keeping an eye on David Krejci were his family and the Boston Bruins. Now, it's hard to take your eyes off him as the Bruins center is blossoming before our eyes. A second-round selection in 2004, Krejci has 17 goals and 31 assists in 44 games for the Eastern Conference leaders. He has been a tremendous success story. One of Krejci's best moves is the "give-and-go," but he mixes up his passing options and that creates a lot of time and space for his linemates. "Everything he does is about selling the move," said Mike O'Connell, the Los Angeles Kings' director of pro development, who drafted Krejci when he was Bruins' GM. "His upper body, his eyes, all of that looks like he is going one way with the puck, then he goes the other way. He really reminds me of Adam Oates in that way. I'm thrilled for him -- he's turning into an incredible player." "It's great, watching what he's doing," teammate Marc Savard said. "He kind of reminds me of the way Robert Lang played when he came into the League. Krejci skates better, but a lot of it is the same -- fluid, smooth, shifty." Time for a leader -- The Atlanta Thrashers have abandoned the captains by committee approach and have stitched the "C" on Ilya Kovalchuk's jersey for good. "Everyone realized he was the obvious choice from the beginning," defenseman Mathieu Schneider told the Atlanta Journal Constitution. "It was a point in the year where we've kind of stalled. I think it could be a bit of a kick-start for us." "We just decided it was time we put someone as our leader, kind of put that behind us and move forward," teammate Colby Armstrong said. "I think it's important for Kovy, too. He's the kind of guy that when he's going we all follow. Hopefully this can put us in the right direction." Coach John Anderson expressed doubts earlier in the season about whether Kovalchuk wanted to be more of a leader. Now, he said, Kovalchuk is ready. "He's a franchise player," Slava Kozlov said. "It's a lot of responsibility, but I think he can handle it. Sometimes [as a captain] you can do things you can't do without the C. He's our leader, and we're going to follow him." Deep breaths, everyone! -- You had to figure Paul Maurice was going to be the nervous one going into Thursday night's game against the Maple Leafs. After all, Maurice, now the Carolina Hurricanes coach, had been behind the Leafs' bench last season. But the Toronto media contingent were the ones Maurice felt needed to relax as they pressed the issue on whether Maurice had said he hopes the Leafs would lose for 10 years. "I hope we beat them every time we play them for the next 10 years, no question," Maurice said at the time. Seems pretty logical to me. Every coach wants to win every game, but to go up against a team that fired you brings extra incentive, after all. "Let's do another one," Maurice said trying to make light of the silliness. "I hope every team in the League loses every game for 10 years, and we win every game forever. ... Breathe a little." As Javier Serna reported in the Raleigh News and Observer, a Toronto writer read Maurice's initial words back to him, for what reason remains unclear. "I think Paul that the quote that you said that maybe you don't remember is, 'It's absolutely personal. You get fired, you want to see that team lose every game for the next 10 years.' "
Maurice responded: "You take that personally?" "Why wouldn't ya?" Maurice said. "So the other option is this: I'm cheering for them. You know what? Why don't you just take it as a quote and enjoy it a little bit. And don't take this as, you know, I'm stalking the team. All right? I would prefer that the Hurricanes won more than the Leafs. Can we do that? Breathe. All of you." Magic tough -- Coaches are loathe to take credit for a team going well, because you never know when it's going to flip to the other side. So Claude Julien isn't saying much about the success of the Boston Bruins, but his players are filling the gaps. 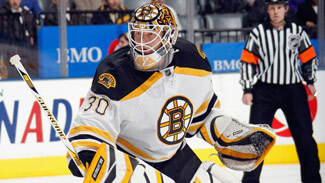 "Be good defensively and create offense," Marc Savard said of the Julien way. "You always have the respect for defense in your head and you always want to get back on every play and clog up the neutral zone. It's pretty simple but he works on it day in and day out and that's why we're pretty good at it." Julien is genuinely modest and hard working. Bruins GM Peter Chiarelli revealed the coach is the first one there in morning and last to leave, usually holed up in his office viewing video. Named to coach the Eastern Conference in the Jan. 25 NHL All-Star Game in Montreal, Julien diverted credit to his assistant coaches, Craig Ramsay, Geoff Ward, and Doug Houda. "It's a great honor, but it's caused because of the people around you," Julien said. "The head coach always gets the credit. Yet his assistant coaches around him do an unbelievable job. I think going there and representing our team is the right term. It's because of the people around me that I get the opportunity to go to that game." "We definitely have a good team here and he's done a lot for us," left winger Michael Ryder. "He knows how to use us as a team and it's good to see him get there. He deserves it."